description A head-and-shoulders portrait drawing of a boy, seen in full face view, with head turned partly to the left, and one side of his face cast in deep shadow. His eyes are downcast and deeply shadowed and his expression sorrowful; dressed against the cold, he is tightly wrapped in hat, coat and scarf. Executed in oil and charcoal on brown paper, the work was made in Whitechapel. Although nothing further is known of this work, it may have similarities to a portrait that Frankfurther showed at the East End Academy's annual exhibition at the Whitechapel Art Gallery in 1954, under the title 'Barrow Boy', where 'The Times' noted that 'Miss Eva Frankfurther has several picturesque paintings of East End types'. The 'Hackney Gazette' declared that 'Probably the most impressive artist, as always, is Eva Frankfurther, whose strong sombre portraits of the people of the Whitechapel back streets are true and moving without being morbid'. 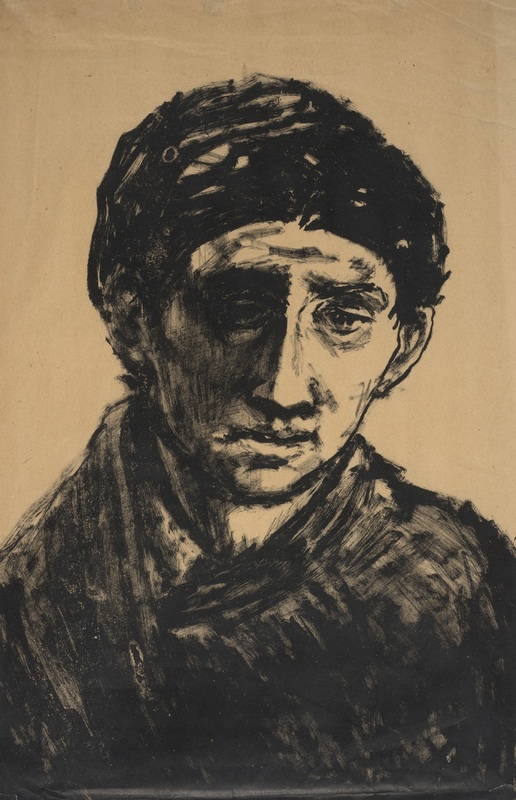 Mervyn Levy, critic of 'Art News and Reviews', who decried the general standard of portraiture at the exhibition, went further declaring that 'there is at least one superb portrait here - Eva Frankfurther's tristful 'Barrow Boy'. It is moving and trenchant, brimming with a sense of that stark struggle for existence which, as the ocean gnaws the land, exfoliates the living flesh from the bone, tossing back, like a well-worn pebble, a sallow husk, with only a fag-end, and great eyes like sunken black jewels, to meet the challenge of the jungle of the streets.' A lithograph of this subject was shown at the Frankfurther retrospective at the Ben Uri Art Gallery in 1962.